Would you like to host an event? Close locations in London (but 1600 ee’s in UK and New York) unique that people can work in different locations just get off a different tube stop, they do not need to leave. Strong family culture driven by founders the Kemps. Four things that drive the business; design, the people, our high standards and inspirational service. As a business they deep dive into what their people think and the challenges people face. HR team really get insight into the metrics done monthly to see the trends and patterns in their people stats. This is what they did to engage their people…..They do breakfast clubs and in return for a full service breakfast they want to hear people’s views. Opinion page on their talent toolbox, best places to work survey gives them a lot of insight into what is important and they get rankings from this. Diverse workforce, 60% over age 30 and quarter more than 5 year’s service, third promoted in the business every year creates opportunities and giving people feedback on performance is key to retention. Getting social – people like the social side to the workplace, money rewards popular for the majority but not for everyone. They do a huge range of things to keep people engage, events to bring people together, so HR needed to build on what was already there but keep the family feel and have synergy with their guest brand. Strengthen communication was their first step – so set up talent toolbox dashboard to be in one place as a communication platform. Jobs, careers, HR policies, handbook etc updates messages all in one place. Everyone has access to the platform and they made sure there was something for everyone. Focused on the whole ee’ journey – kept it simple and made sure it was all joined up. “Love what you do” – combines family feel, values what you stand for and what you believe in. This is their engagement thread. They got ee’s together to ask them what they thought incentives should be and the simple answer form employees was to be rewarded for demonstrating the values, people get recognised with a mannequin representing the values and these are publicly shared. They get £1 for every value they achieve, if they get all 5 they get a bonus of £25. They use the incentive to reach the harder to get to employers who maybe do not serve guests, but the simplicity of the scheme means back of house people are fully included. Set up employee engagement week – a different focus each day, L&D, R&R, knowledge day and Values, Housekeeping Olympics, chefs relays etc They have now invested in longer activity ‘Firmdale Live’ to make it an experience that everyone could join in one day a month to focus on the different areas. Recreated the event so it would fit in a bedroom! L&D got the bathroom (rubber ducks in the bath) make it an interactive activity to fairground tunes, wellbeing and benefits is a big wheel that people get to spin and you get asked a question to win a prize or do an activity, the third area is Firmdale Live and this focuses on the social side to life in Firmdale. Knowledge days – developed the idea of where suppliers come together from butchers (guess the weight of the lamb), Wedgewood get to make your own mythical creatures mug that get put in the kiln and returned to people, eat drink and taste things. In 2018 a quarter of employees attended this. ‘Love what you do awards” to recognise those who go above and beyond. It is all live streamed if people do not have the opportunity to take part they can view it. Yapster is a news feed and is a mix of WhatsApp and instagram where people can simply stay in touch and share messages. Brought all their platforms together for single sign on – talent toolbox, Flow their learning platform as well as Yapster. Personal career paths – use the platform to share with their managers on what they wanted to do, created an interactive path of all the different leaning opportunities they can get involved with. English lessons – fully funded for their employees each week and can take their B1 certificate also funded this led to 96% retention of these employees and massively improved their communication. The results – 10% increase in revenue last year, engagement over 80%, 72% retention and high referrals for friends to work there. 9% who leave do come back. 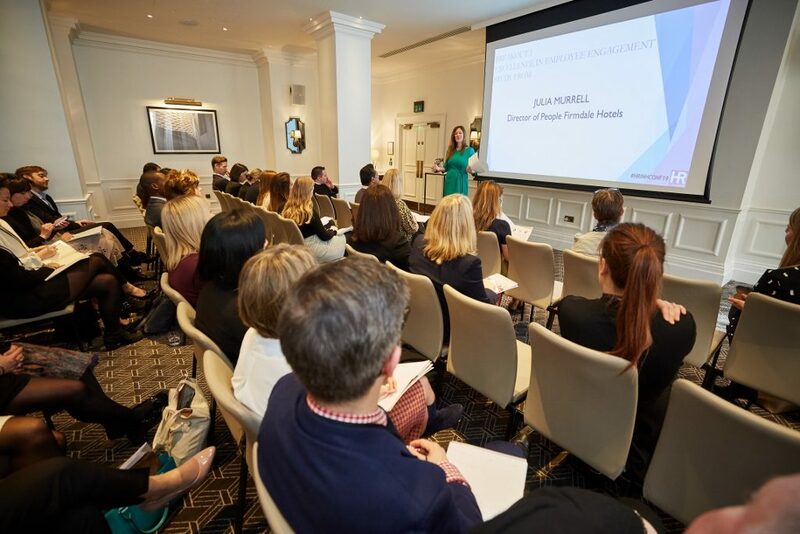 Firmdale strongly believe that investing in their people and engagement really pays off and it is a collaboration of all people in the business making this happen. HR needs to be creative and really think about putting themselves in their employees shoes to be able to engage them. Embed the code below or click an icon to share to social media.